Enrique Miguel Iglesias Preysler better known as Enrique Iglesias is a Spanish pop music singer-songwriter. Iglesias was born in Madrid, Spain, the third and final child of singer Julio Iglesias and socialite and magazine journalist Isabel Preysler. His mother is Filipino and his father is of Galician Spanish and Jewish ancestry. His parents divorced in 1978, and the following year Julio moved to Miami, Florida to continue with his musical career. In 1985, Enrique Iglesias' grandfather, Dr. Julio Iglesias Puga was kidnapped by the terrorist group ETA. For their safety, Enrique and his brother Julio Iglesias Jr. were sent to live with their father in Miami. He also lived in Belgrade, Serbia for one year with his mother, who worked as a journalist. As his father's career kept him on the road, the young Iglesias was raised by the family nanny. He attended Gulliver Preparatory School and went on to study business at the University of Miami. Iglesias did not want his father to know about his plans for a musical career and did not want his famous surname to help advance his career. He borrowed money from his family nanny and he recorded a demo cassette tape which consisted of a Spanish song and two English songs. Approaching his father's former publicist Fernan Martinez, the two promoted the songs under the stage name 'Enrique Martinez' with the backstory of being an unknown singer from Guatemala. Iglesias was signed by a record label called Fonovisa. Dropping out of University, he went to Toronto to record his first album. On July 12, 1995 Iglesias released his first album titledEnrique Iglesias, a collection of light rock ballads, including such mega-hits as "Si Tú Te Vas", "Experiencia Religiosa", and others. The record sold half a million copies in its first week, a rare accomplishment then for an album recorded in a language other than English. His song " Por Amarte" was included in Televisa's telenovela Marisol, but with a twist: instead of Por amarte daría mi vida (To love you, I'd give my life), the words were Por amarte Marisol, moriría (To love you, Marisol, I'd die). The CD also yielded Italian and Portuguese editions of the album, with most of the songs translated into those languages. Insisting on stadiums, that summer, Enrique, backed by sidemen for Elton John, Bruce Springsteen and Billy Joel, played to sold-out audiences in sixteen countries. Beginning the tour in Odessa, Texas the tour went on to three consecutive nights in Mexico's Plaza de Toros, two consecutive nights at Monterrey's Auditorio Coca Cola and two at the Estadio River Plate in Buenos Aires, Argentina to over 130,000 people as well as 19 arenas in the U.S.
After the success of "Bailamos", several mainstream record labels were eager to sign Enrique. Signing a multi-album deal after weeks of negotiations with Interscope, Iglesias recorded and released his first full CD in English, Enrique. The pop album, with some Latin influences, took two months to complete and contained a duet with Whitney Houston called "Could I Have This Kiss Forever" and a cover of the Bruce Springsteen song "Sad Eyes". The album's third single, "Be With You", became his second number one. The final single from the album was the song "You're My #1", re-recorded and released in selected territories as a duet with local acts – Alsou in Russia, Sandy & Junior in Brazil and Valen Hsu in Asia. Iglesias capitalized on the album's success with his "One-Night Stand World Tour" consisting of 50 sold-out shows in 16 countries. Including Radio City Music Hall and three consecutive nights in London's Royal Albert Hall, the tour ended with a big show at Stadium National Lia Manoliu in Bucharest, Romania. The concert launched MTV Romania, with the video for "Love to See You Cry" being the first to be shown on the channel. Iglesias released his new album Insomniac on June 12, 2007. The album was so named due to it being recorded mainly at night. The album contained a more contemporary pop style than that of previous albums. The album's highlights include "Push", with rapper Lil' Wayne, as well as "Ring My Bells", and a cover of Ringside's "Tired of Being Sorry". The first single Do You Know? (The Ping Pong Song) was released on April 10, 2007. It was the Iglesias's highest charting song on the Hot 100 since "Escape" it was also a it throughout Europe peaking in the top 10 in many countries and the Spanish version entitled "Dímelo" was #1 on Hot Latin Tracks from 12 weeks becoming his second best performing song on that chart. Iglesias followed up with the ballad "Somebody's Me", which was released as a single in the American continent. The song was played extensively on AC radio and peaked high on Billboard's Hot AC, where the Spanish version also performed well. In Europe, the second single was "Tired of Being Sorry", which performed well in many countries; he recorded a version of the song with French singer Nâdiya which was #1 in France for one week. On July 4, Enrique Iglesias became the first Western artist to play a concert in Syria in three decades when he performed for a sold-out crowd of 10,000 in the capital city of Damascus and in the same week performed on Live Earth. The Insomniac World Tour was launched at the Dome in Johannesburg, South Africa, the same venue he ended his last world Tour and took him to sold out arenas throughout Europe. It was his first arena tour of the UK with him playing venues such as Manchester's MEN Arena and Wembley Arena. The tour ended with Iglesias performing at newly opened L.A. Live. A second leg of the tour has taken him throughout Latin America from Mexico to Argentina. Enrique released a Spanish Greatest Hits album on 25 March 2008 which included his seventeen #1 songs on Hot Latin Tracks chart, plus two new songs. The first single was the song "Dónde Están Corazón", which is written by Argentine star Coti and became Iglesias's 18th #1 single on Billboard's Hot Latin Songs. The album debuted at #1 on Billboard's Latin Album Charts and #18 on Billboards top 200 Album chart. It was Enrique's second Spanish Album to debut in the top 20 Billboards Top 200 Albums (Quizás debuted at 12 in 2002). The album has been recently certified double platinum in the U.S.and in some Latin American countries. The album's second single Lloro Por Ti had an official remix featuring Wisin y Yandel which also reached #1. Iglesias did a tour of the US. Beginning in Laredo, Texas and ending at the Izod Center in New Jersey he was accompanied though most of the tour with Bachata band Aventura who also performed "Lloro Por Ti" with him at the Premios Juventud. Iglesias was a surprise performer at the Lo Nuestro Awards, opening the show with a medley of "Dónde Están Corazón" and "Dimelo". He also performed at the Billboard Latin Music Awards, where he received a special award. After the success of his Spanish Greatest Hits compilation, Iglesias released a compilation of his English language hits on November 11. The album includes "Can You Hear Me" as well two new songs. The first single is entitled "Away" ft Sean Garrett and was followed by "Takin' Back My Love" ft Ciara. After the successful collaboration with Nadiya Iglesias has recorded a second duet with her called "Miss You" which featured on a delux edition of the album. The album debuted at #3 on The Official Uk Album Chart and sold over 80,000 copies in its first 2 weeks alone. Enrique was the winner for two World Music Awards in the categories of "World's Best Selling Latin Performer" and "World's Best Selling Spanish Artist", in the ceremony held in Monaco on November 9, 2008. Iglesias is finishing recording a new album which will be released in June/July of 2010. It will be half in English and half in Spanish, and Iglesias wrote or co-wrote most of the material. It will include a new song with Wisin & Yandel. Another confirmed collaboration is with Juan Luis Guerra. The album, produced with RedOne, Mark Taylor, and longtime collaborator Carlos Paucar, will feature 14 tracks. There will be two different singles, one in Spanish called "Cuando me Enamoro" featuring Juan Luis Guerra, and other one in English. Iglesias has also donated the song "It Must Be Love" to raise funds for the victims of the 2010 Haiti earthquake. The song has been released to Music for Relief, which is a charity organization founded by Linkin Park. On February 1 Enrique recorded the re-make of the classic "We Are the World" with other music artists. The song and video premiered on February 12 at the Opening of the Winter Olympics and proceeds from the song went to help victims of the earthquake in Haiti. Iglesias has announced that his new album to be released in the third or fourth quarter of 2010 will contain a 50:50 ratio of English and Spanish language songs. The first single, "Cuando Me Enamoro", will be released on 26 April 2010. The English single was announced to be named "I Like It" and its said to be release short after the spanish single. Since the beginning of his career the media has linked Iglesias to many women though due to Iglesias's generally private nature it's difficult to know which are true and which are fabrications. Most notably Iglesias has been linked with Sofia Vergara, Samantha Torres and publicly dated Alicia Machado for a brief period. After crossing over into English he was linked in the media to Christina Aguilera and later Jennifer Love Hewitt who he remained friends with and ended up co starring with in the music video for Hero a year later. For six years now he has publicly dated tennis star Anna Kournikova whom he met on the set for his music video Escape. Many reports started showing up in 2007 of them splitting, and in 2008 after Enrique made a publicity joke, people made accusations of the couple being formerly married and now divorced. Enrique has stated in subsequent interviews that it was simply a joke, and they are still very much together. Iglesias has sold over 60 million albums worldwide, has had two Billboard Hot 100 #1s and one #3, and holds the record for producing 20 number 1 Spanish-language singles on the Billboard's Hot Latin Tracks. 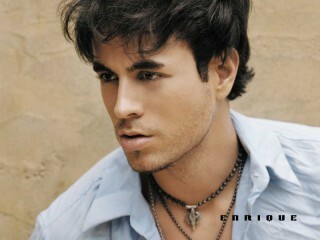 View the full website biography of Enrique Iglesias.